As world leaders gather at UN Headquarters to participate in high-level events at the General Assembly, many of them are signing multilateral treaties (a treaty to which three or more States are parties). 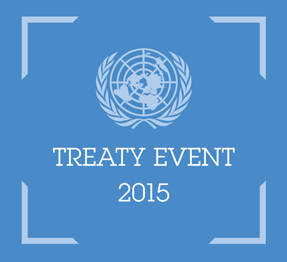 More than 560 multilateral treaties are deposited with the UN Secretary-General. From the UN Charter (the treaty signed by 50 States on 26 June 1945, founding the Organization) to the Convention on Transparency in Treaty-based Investor-State Arbitration (the most recent treaty adopted by the UN General Assembly, on 10 December 2014), the UN has been the place where States conclude multilateral treaties over the past 70 years. Multilateral treaties have grown in number and complexity, covering a wide array of international affairs, including disarmament, the law of the sea, trade and transport, the protection of human rights, the fight against terrorism, and the preservation of the environment. A number of multilateral treaties are close to achieving universal participation, which means that almost every state has ratified them. In terms of participation, the Vienna Convention and the Montreal Protocol are two of the most successful international treaties of all times. In 2009, the Vienna Convention became the first treaty in history to achieve universal ratification, i.e. every State in the world is party to it. Both treaties deal with the protection of the Earth’s vital, but fragile ozone layer that protects life on Earth from some of the sun’s harmful ultraviolet rays. Thanks to the treaty, the ozone layer is set to recover by around 2050. Adopted at the Rio Earth Summit in 1992, this convention showed States’ recognition – for the first time – of the climate as a “common concern of humankind.” Parties to the treaty acknowledged the dangers of greenhouse gases. They committed to the ultimate goal of stabilizing these gases in the atmosphere at a level that would prevent “dangerous anthropogenic [human-made] interference with the climate system.” The actual limits of these gases were only set later, in the treaty known as the Kyoto Protocol (itself ratified by 192 States). This treaty recognized for the first time in international law that the conservation of biological diversity is “a common concern of humankind.” The agreement, signed by 150 government leaders at the 1992 Rio Earth Summit, covers all ecosystems, species, and genetic resources. But it is about more than plants, animals, micro- organisms and their ecosystems – it is about people and our need for food security, medicines, fresh air, water, shelter, and a clean and healthy environment in which to live. It is dedicated to promoting sustainable development and aims to develop national strategies for the conservation and sustainable use of biological diversity. At the Rio Earth Summit in 1992, leaders agreed that desertification – the process of fertile land turning into desert – was one of the greatest challenges to sustainable development. Desertification means there is less available land for crop-growers and animal-herders, increasing the pressure on other land and creating a dangerous feedback loop. Parties to the treaty agreed to work together to help affected States with funding, technology and knowledge transfer. States affected agreed to establish national and regional action plans, working with local populations to reverse the land degradation. Adopted in 1989, the Convention on the Rights of the Child has become the world’s most-ratified human rights treaty. It aims to protect and promote the rights of all children around the world. It emphasizes the right to survival and development as well as protection against abuse, neglect and exploitation. It also addresses education, health care and juvenile justice as well as rights as simple as having a name and a nationality from birth. Those States who have ratified the convention must report annually to the Committee on the Rights of the Child. The treaty has served as a powerful tool for groups campaigning for children. NOTE: Numbers listed may be higher than the 193 Member States of the United Nations, as some treaties open their membership to other entities, such as the Holy See or the European Union. Be a part of social media conversations!